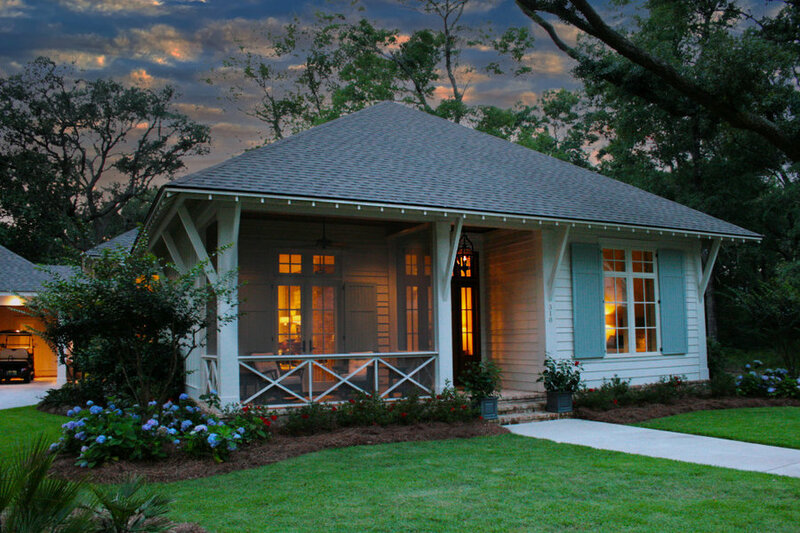 CHP-2233-A-56 Southern cottage built by Achee builders of Fairhope, AL. 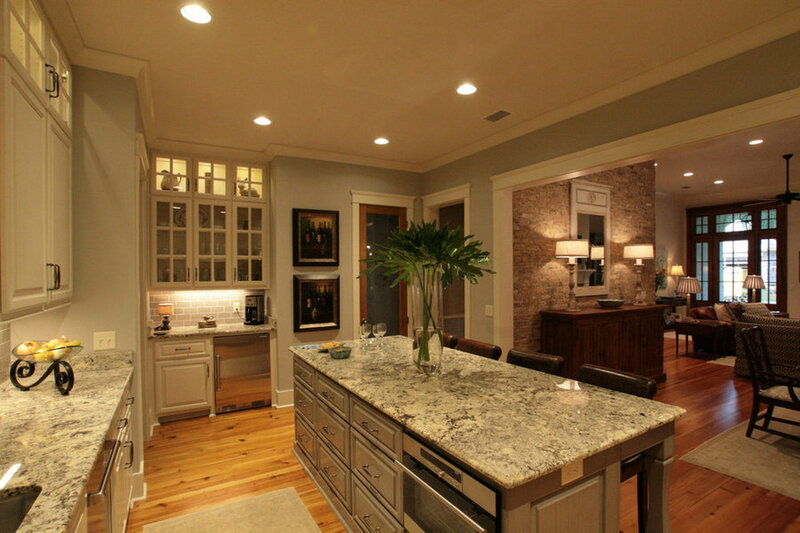 Designed by Bob Chatham Custom Home Design. 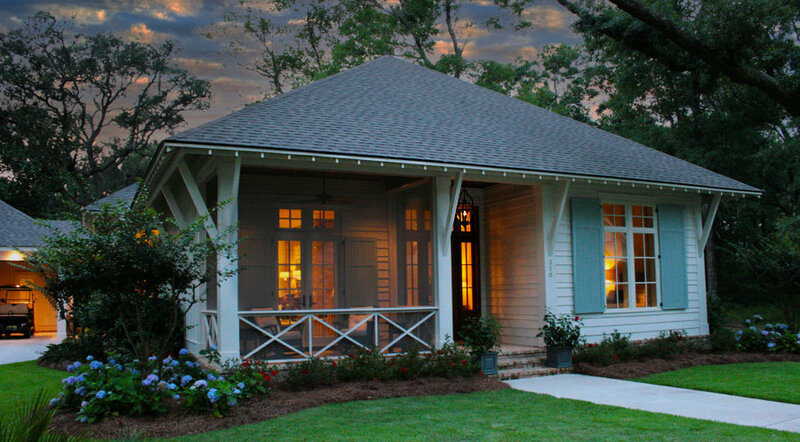 This is a classic southern style cottage nestled on a wooded lot with a screened in porch, operable shutters on large windows with transoms. 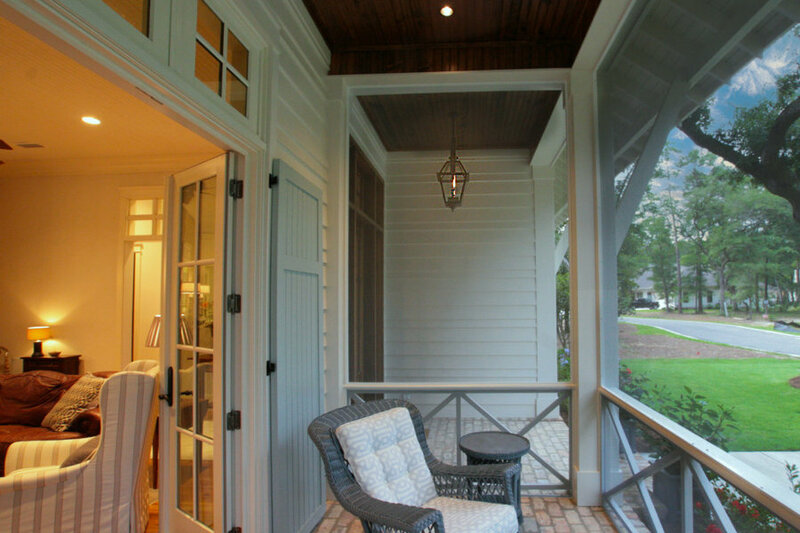 The roof is stylishly detailed with open rafter tails and decorative roof brackets. The Old Chicago Brick skirt adds a classic look. 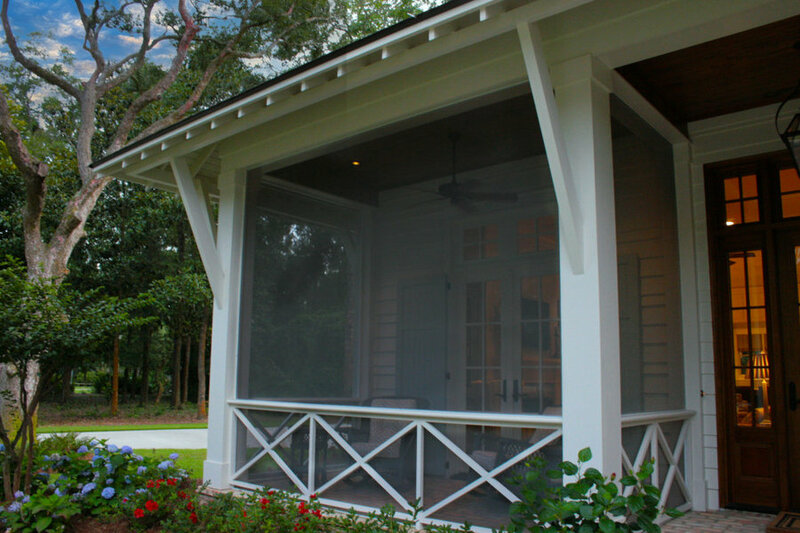 The cottage has a detached carport and storage shed with a covered walkway and an outdoor kitchen and living area. 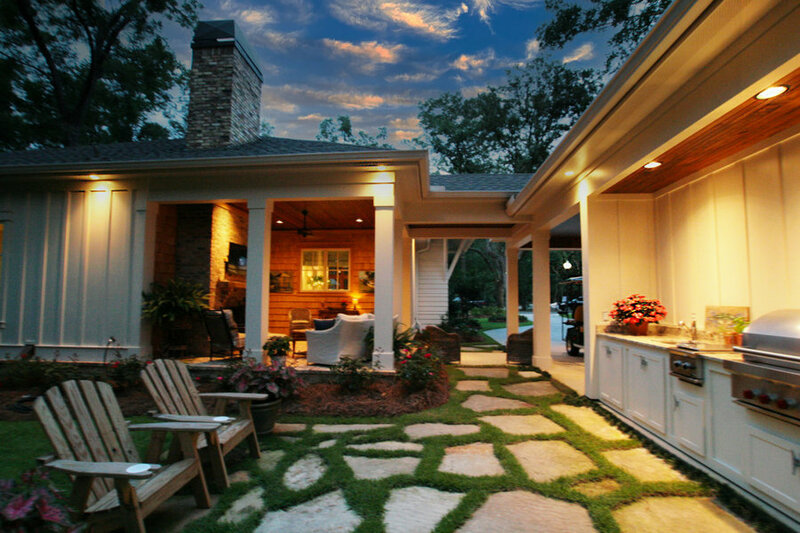 It was built by Achee Properties and designed by Bob Chatham Custom Home Design. 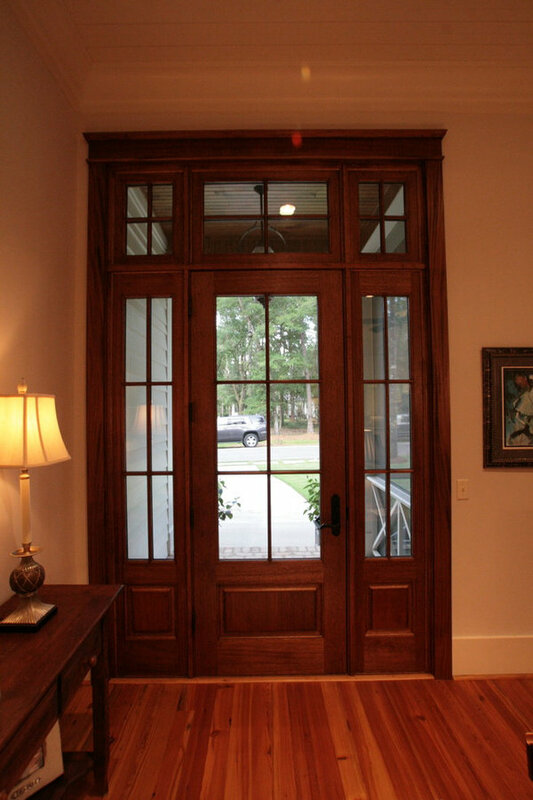 This entry has a stained wood ceiling and hanging gas lantern for a touch of class. 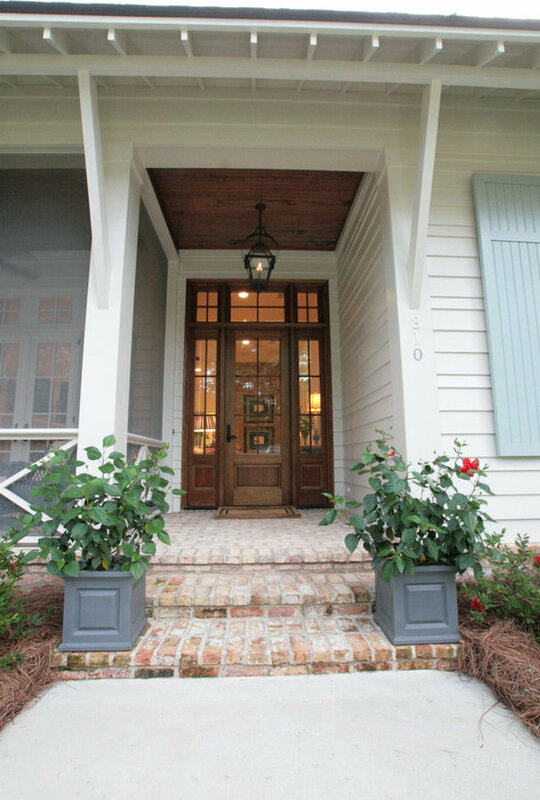 The wood and glass door with side lights and transoms along with brick porch floor give the entrance a southern charm. 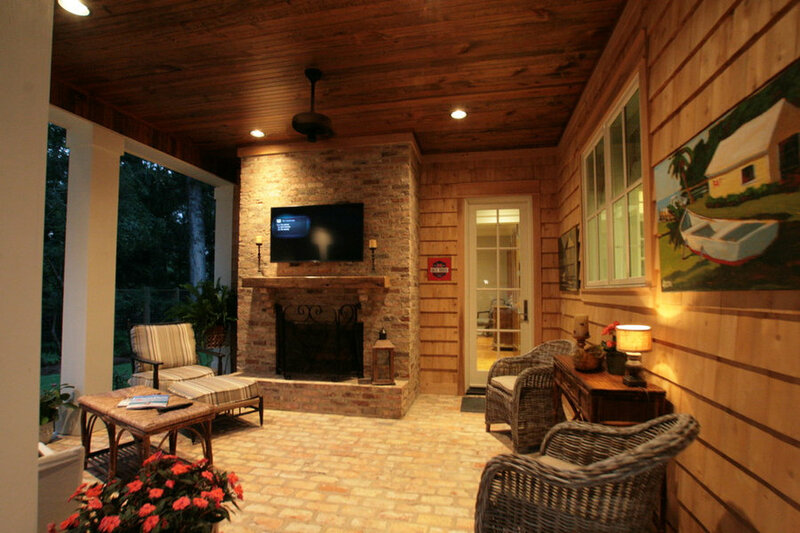 This living room has french doors leading to a covered porch. There are plenty of windows and an open floor plan for light. 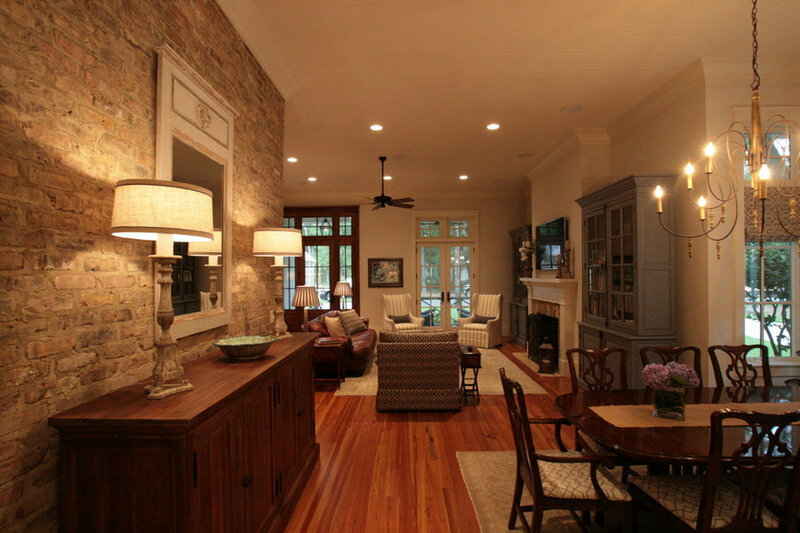 The white crown molding and trim contrast the stained wood floors and brick fireplace for a timeless look. 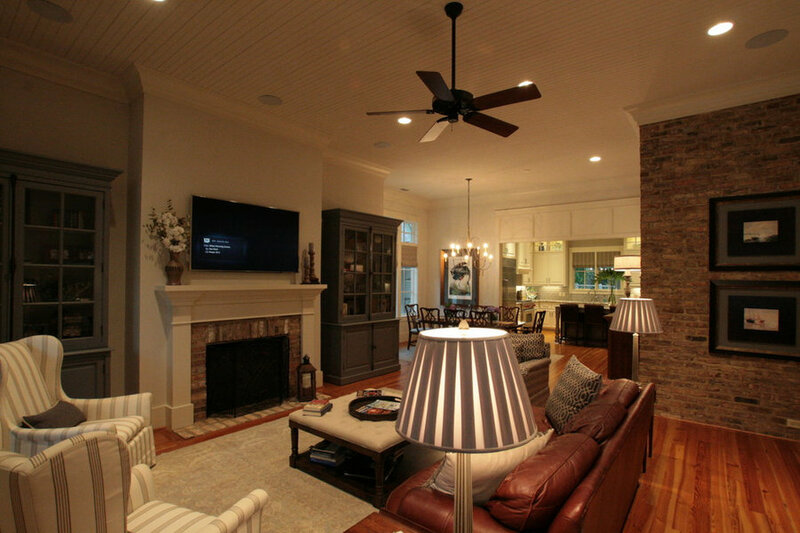 Built by Achee Properties and designed by Bob Chatham Custom Home Design. 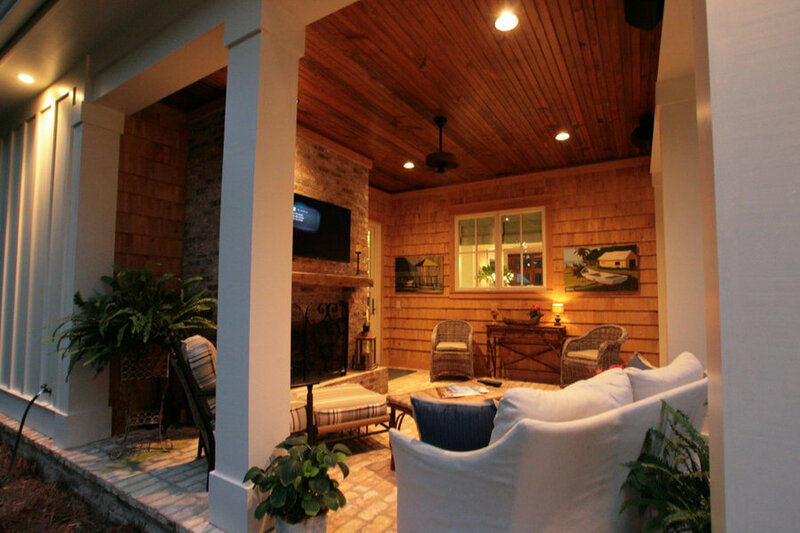 This living room has french doors leading to a covered porch. There are plenty of windows and an open floor plan for light. The white crown molding and trim contrast the stained wood floors and brick fireplace and accent wall for a timeless look. 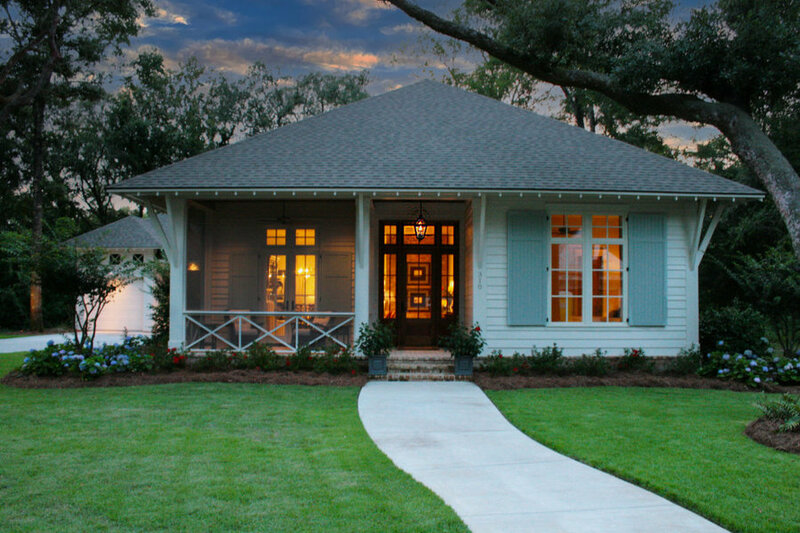 Built by Achee Properties and designed by Bob Chatham Custom Home Design. 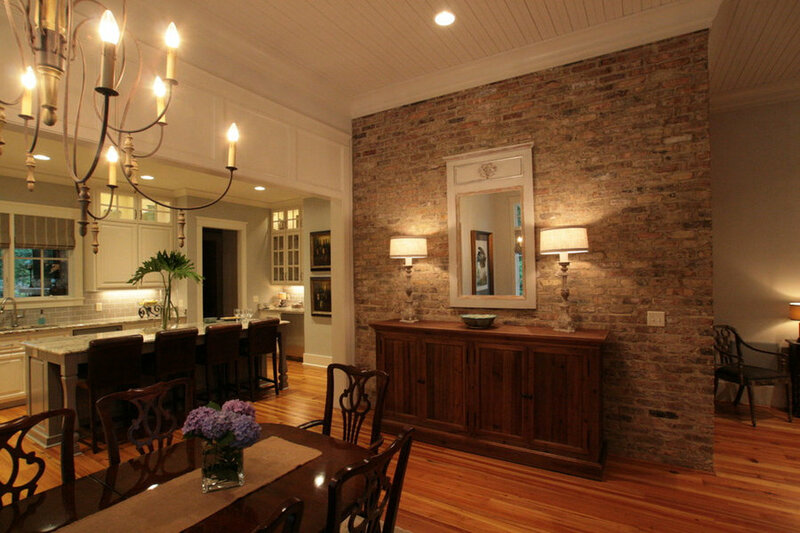 This dining room has an elegant chandelier and brick accent wall for a formal look. There are plenty of tall windows. 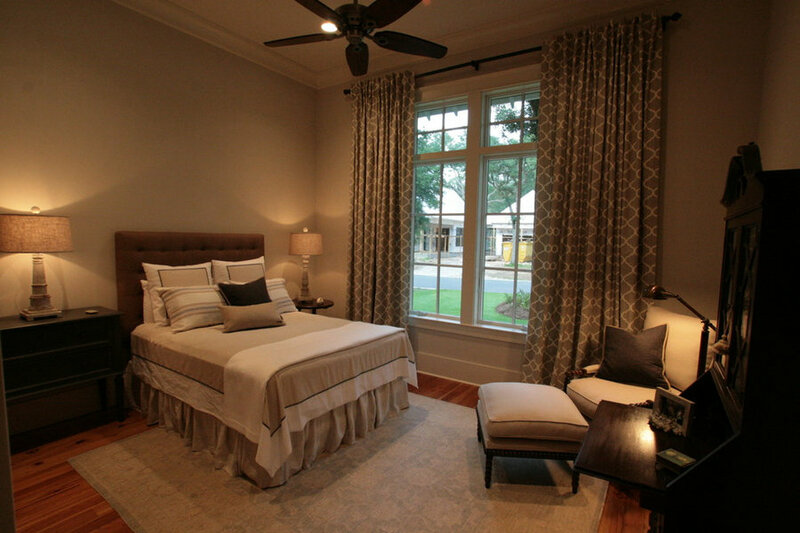 The white trim and crown molding blend perfectly with this look. 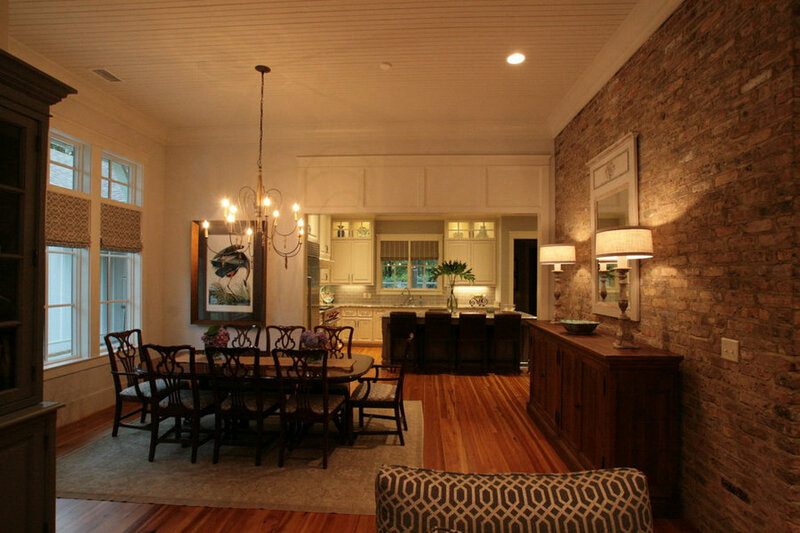 It was built by Achee Properties and designed by Bob Chatham Custom Home Design. 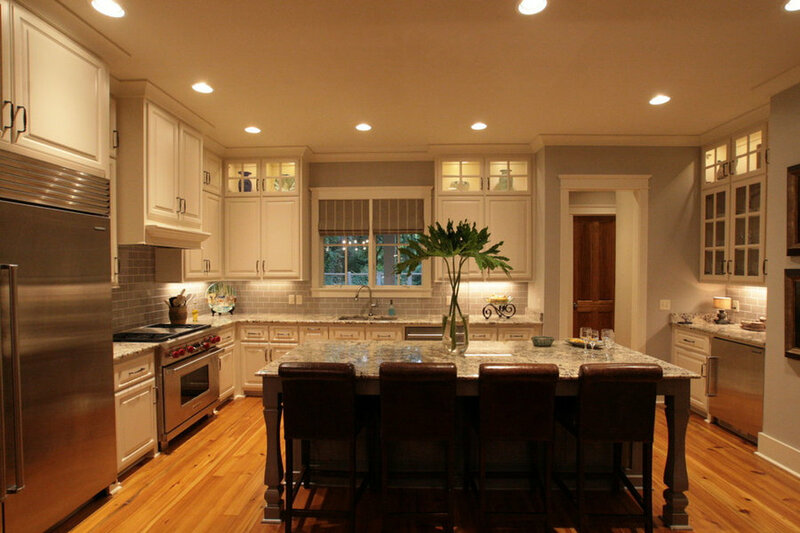 The spacious kitchen has a classic look with a light gray paint and back splash to contrast the white cabinets, trim and ceiling. 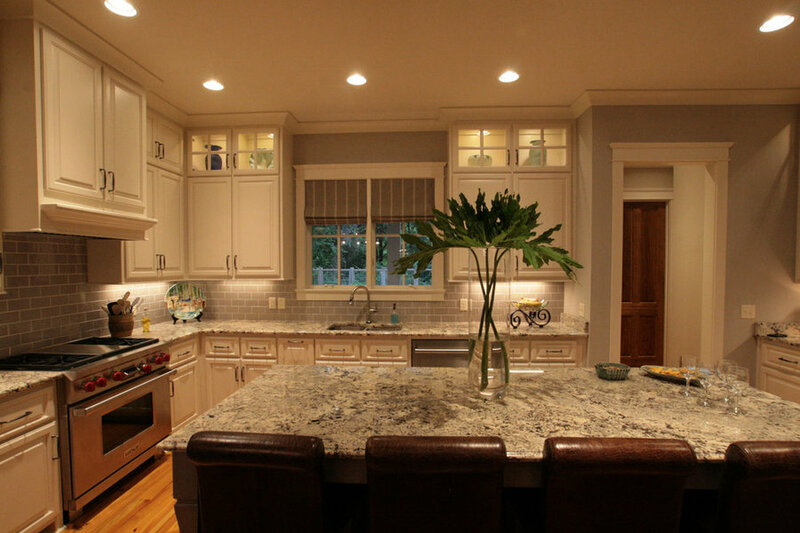 The counter tops have a coordinating granite and the island is a perfect compliment. 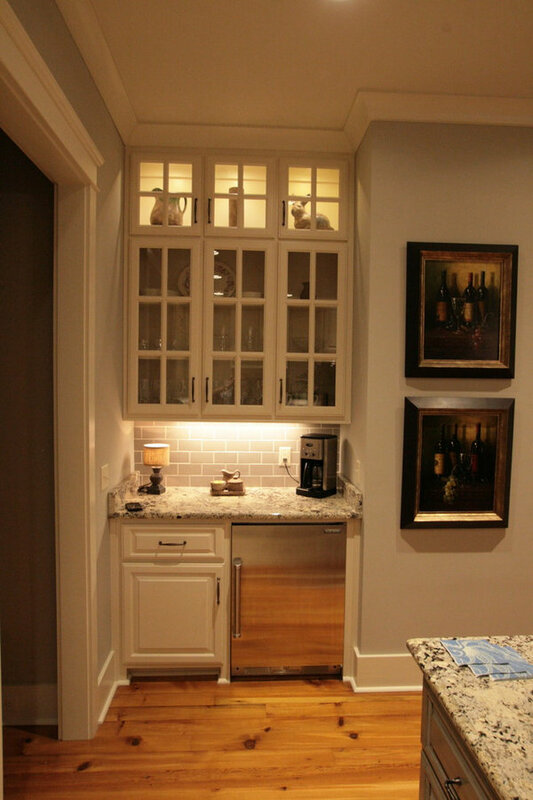 The cabinets have glass display doors for a more formal look. 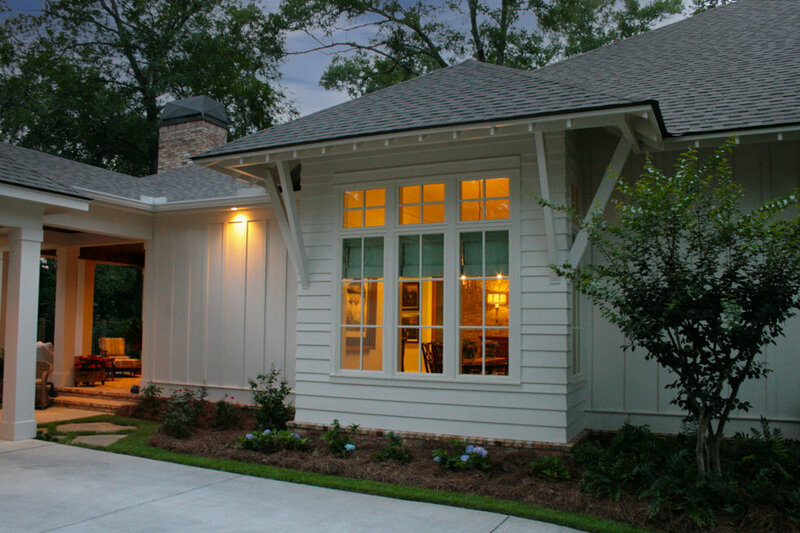 Built by Achee properties and designed by Bob Chatham Custom Home Design. 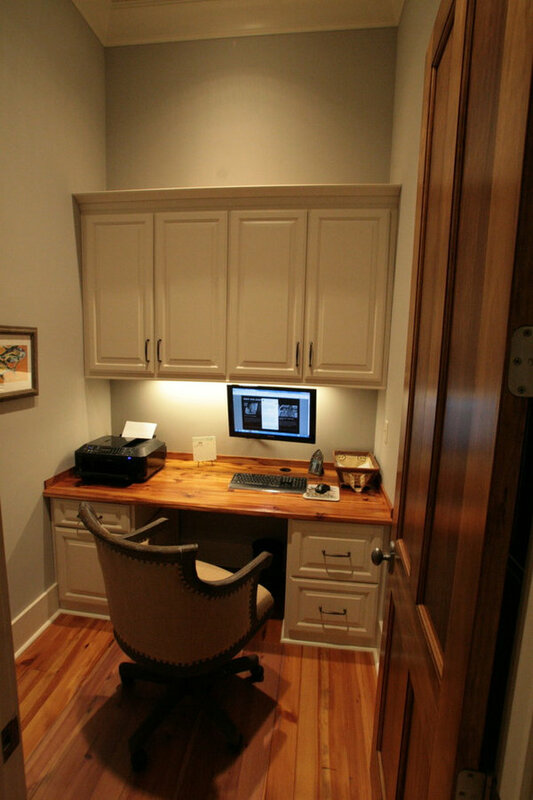 This built in desk and cabinet provides a quiet place to study or catch up on work from the comfort of your home. 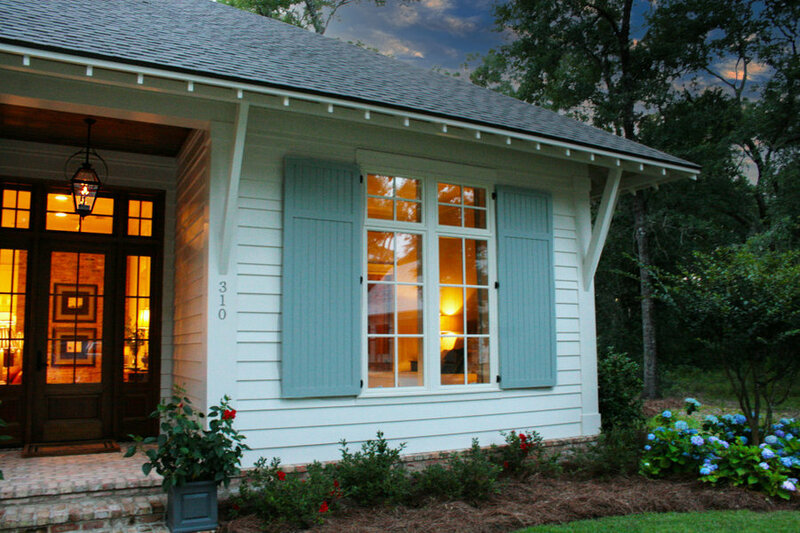 Built by Achee properties and designed by Bob Chatham Custom Home Design. 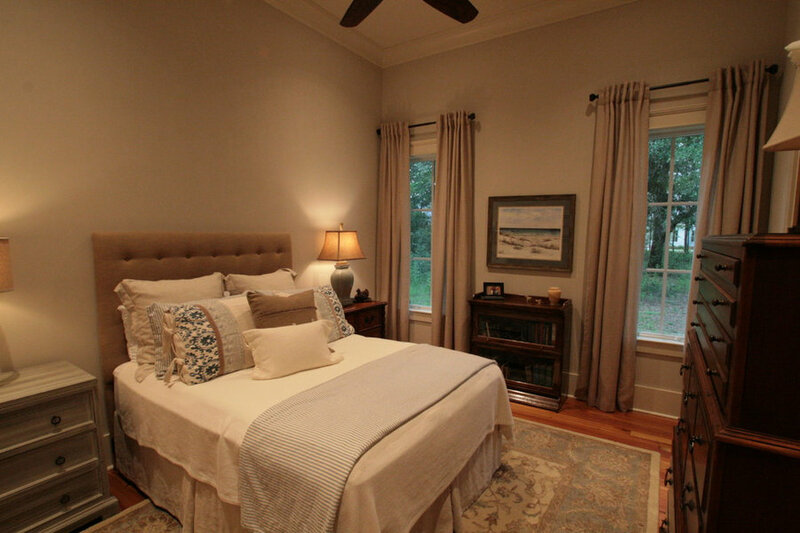 This cottage bedroom has plenty of space and has a classic cottage style with hardwood floors and a warm paint color for the walls. 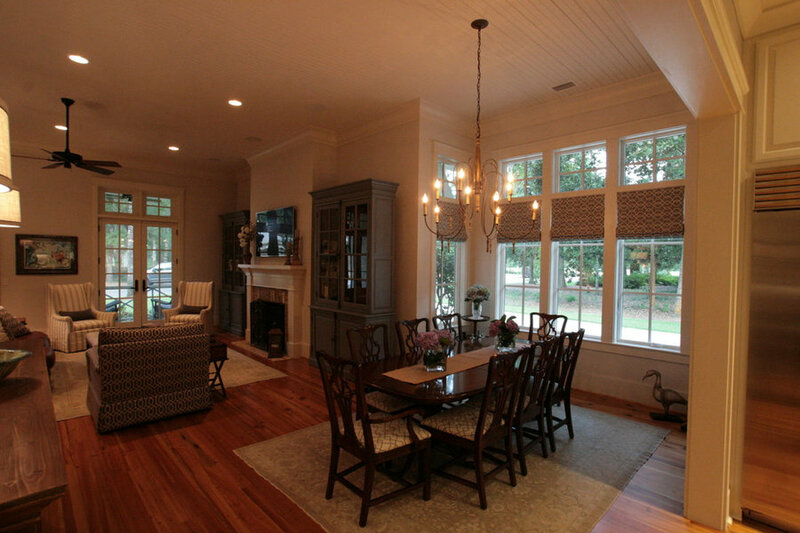 Built by Achee properties and designed by Bob Chatham Custom Home Design. This bathroom has a walk in shower with wood look tile. The vanity has two sinks with built in cabinets on each side. 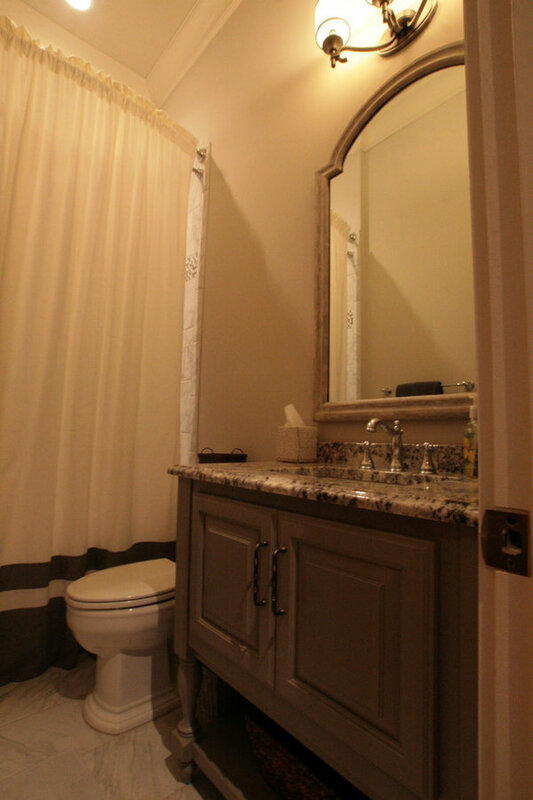 There is a soaking tub and the design is tied together with neutral colors. 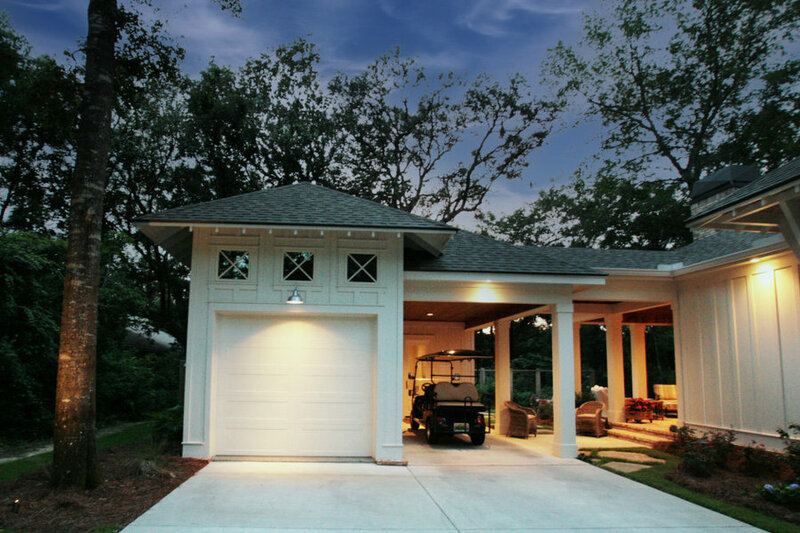 Built by Achee Properties and designed by Bob Chatham Custom Home Design. 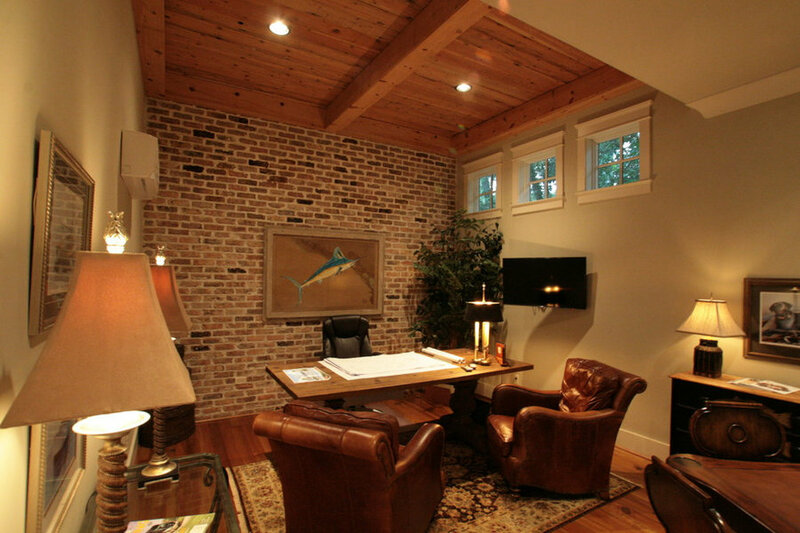 This office has a rustic modern style with a stained wood ceiling with exposed beams and a brick accent wall. 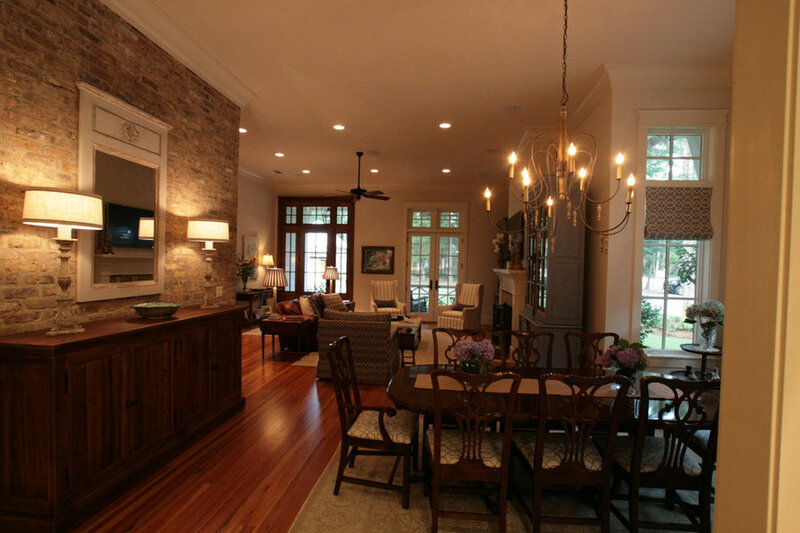 Built by Achee Properties and designed by Bob Chatham Custom Home Design. 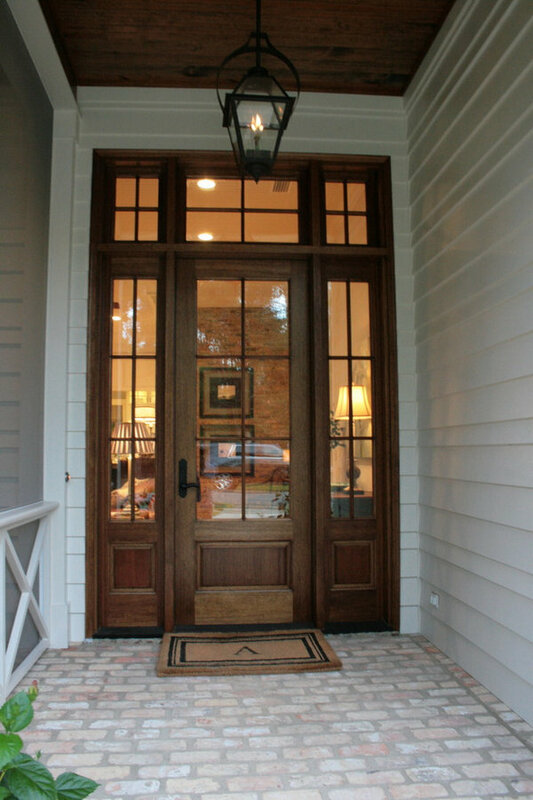 This entry has a stained door with glass and side lights with a transom window. 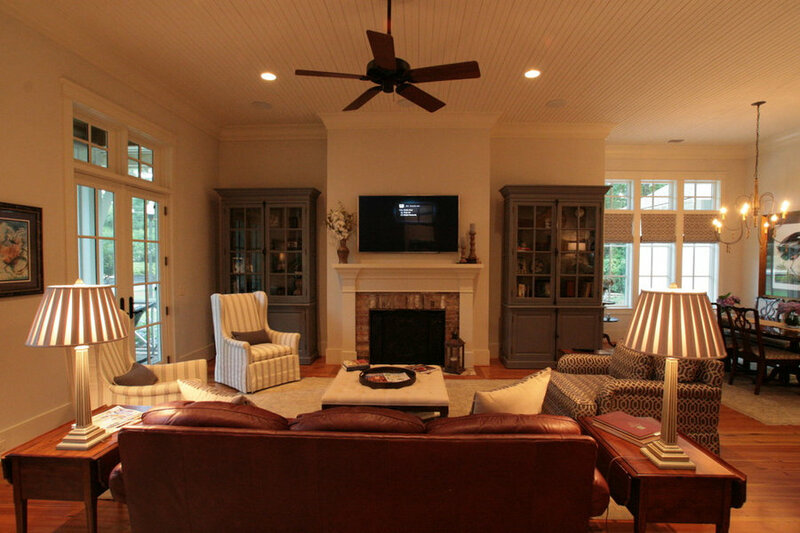 Built by Achee Properties and designed by Bob Chatham Custom Home Design. 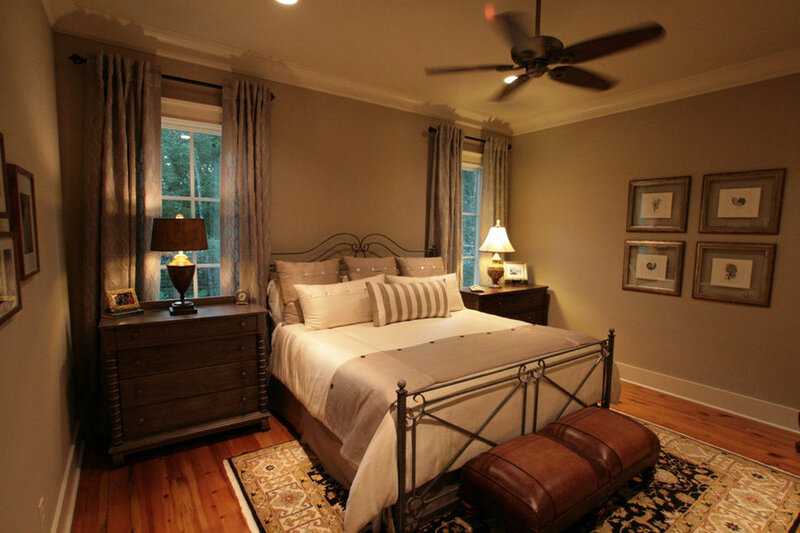 This cottage bedroom has tall windows with transoms and stained wood floor along with trim and crown molding. 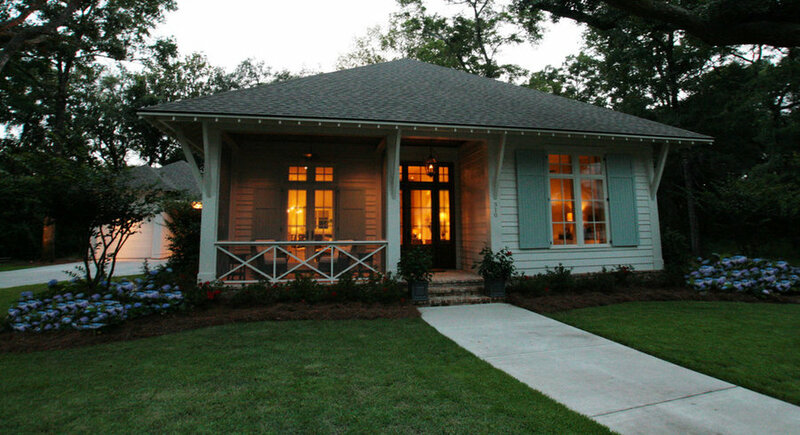 Built by Achee Properties and designed by Bob Chatham Custom Home Design. 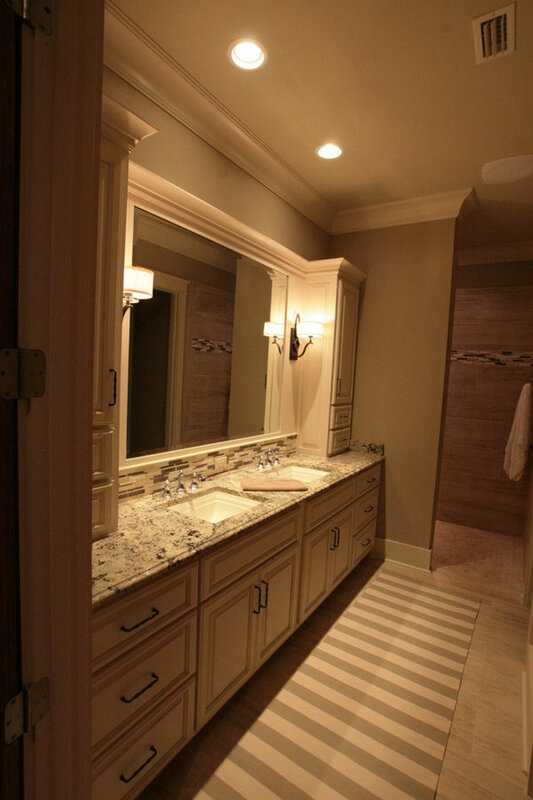 This bathroom has neutral colors and a custom cabinet. 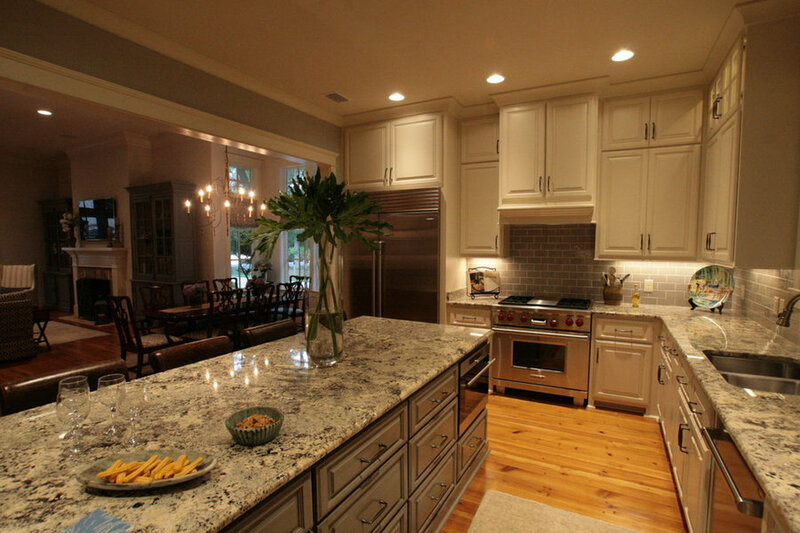 Built by Achee Properties and designed by Bob Chatham Custom Home Design. 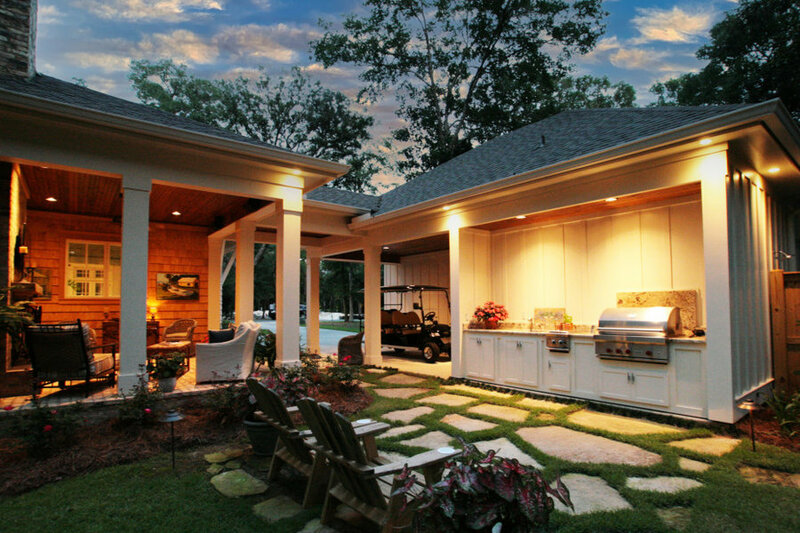 This covered outdoor living area has it all including a seating area with outdoor fireplace and mounted tv, an outdoor kitchen, and open patio. 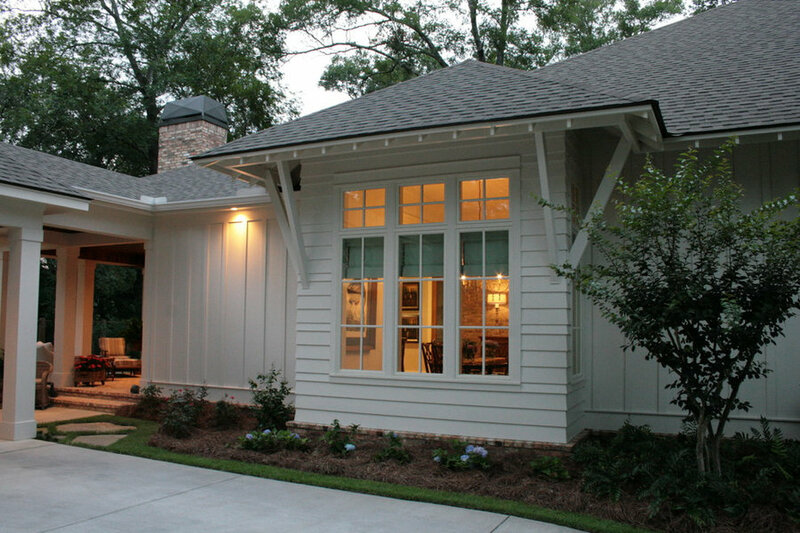 Built by Achee Properties and designed by Bob Chatham Custom Home Design.